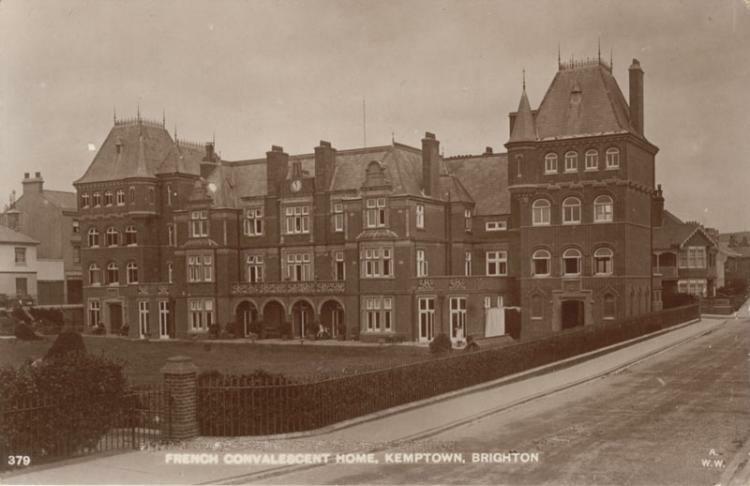 The French Convalescent Home, De Courcel Road, Brighton was built in 1896 to take convalescents from the French Hospital in Shaftesbury Avenue, London. It was funded by money from the French Lottery and English donations. Over the years it developed into a retirement home for the French and people of other nationalities, and was run until 1987 by religious sisters. 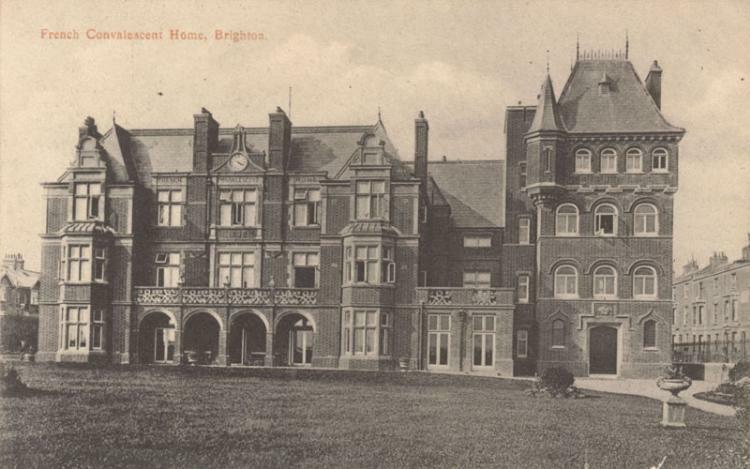 In 1986 it was registered as a dual care and nursing home for 38 residents with the Brighton Health Authority and Social Services. The second tower was erected in September 1904 with an addition to the East Wing in July 1914. The Trustees of the Charity sold the building to Bovis on 29 October 1999 and the residents were transferred to other homes but following a decision to list the Building as an historic Grade II site, it was subsequently sold on and developed into flats. A most enlightening piece by Carol on the French Home. It would appear that, as late as 1954, the home accepted children as inmates, specifically mentally “overactive”, somewhat rebellious, children mostly from French aristocratic families working and living in London and that these were cared for in the same environnement as elderly, somewhat senile old residents. I recently read an account of a child’s stay at the home for three years, when aged five. Would anyone recall a Lady Beckford, Oscar the cook, the Abbe Corentin? I have an undated postcard which shows the building without either tower and without the clock. The date 1898 is on the wall where the clock is in a 1915 postcard. The date 1898 appears to be under the window which has the word Convalescent above it. 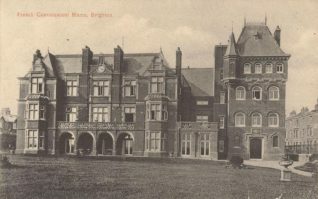 I have just found your site whilst researching for a museum piece on my grandfather, Joseph Marker, who was invalided out to this hospital in 1917. I have some photos of him lying on one of the wards – rows of beds. He always spoke so highly of the nuns who ran the hospital and of their care and compassion. The men were trained to sew and do needlework and I have some embroideries – including on of his regimental badge, the Royal Devonshire Regiment. I also have one or two postcards of the hospital. My grandfather returned to this country after being injured in the Somme – travelling on a hospital ship which was the King of Belgium’s yacht! When I was a kid in the 40s and 50s I attended mass on Sundays at the little chapel in the French Convalescent Home. Very cosy and different. It beat walking from my home in Bennett Road to St. John the Baptist church in Bristol Road especially on wet and windy days. I could be home in five minutes from the seafront at Black Rock. The story and photos you added to this site, Mrs Carol Thomson, are great. My name is Jef de Becker, living in Belgium. When WW1 started and the Germans invaded our country in 1914, hundreds of thousands of people tried to escape the German terror. About 300,000 escaped to England. One of them was my grandmother (my mother’s mother), Theresia Peeters, who went to Antwerp and took a ship there sailing to the UK. After a short time she started working in the French Convalescent Home in Brighton as an assistant-cook. She stayed there until the end of war and always remembered it as a fine place to be. During the war the Home was used partly as a recovery place for wounded or exhausted soldiers. A very interesting event took place in 1916. My grandmother’s brother, Jan Peeters, was fighting during the war in Passendaele. In 1916 he came to England for 10 days with a group of exhausted soldiers; and guess where? The French Convalescent Home. Since the home was run by the French religious order the “Sisters of St Paul of Chartres”, she learned to speak French and English very fluently; she became also a very good cook. As young grandchildren we listened to her fascinating adventures during WW1 and my brother Frans and I visited the place in Brighton in 1974. For 30 years I wanted to write down these WW1 and WW2 war-family stories, but never found the time to start it. Now at the age of 60, the time has come to do so; the story of “Trees Peeters” will be written down. In a few days I will add a few photos as well on this site, which were taken during the time she stayed in the home. I wonder if anyone in the UK has ever seen or can recognise the persons on these photos. If so, please, take up contact with me via this website or my email address: jefdebecker@live.be. I would be very grateful for you doing so.